Magnus Robb and The Sound Approach (2015) The Sound Approach, Poole, UK. Hardback, 308 pages. ISBN Number: 978-9-08109-337-8. Purchase here. 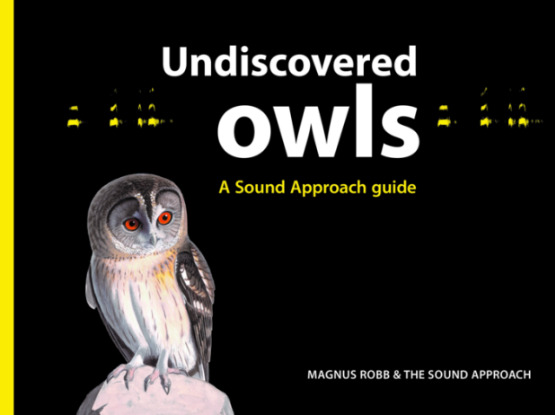 Earlier this year, Magnus Robb and The Sound Approach released their highly anticipated Undiscovered Owls book, which documents the vocalisations of all owl species in Europe, North Africa and the Middle East. This formidable team have generated an unparalleled collection of Western Palearctic bird sound recordings, which they use to popularise birdsong and to propose exciting taxonomic revisions. More on this later on. Visually, this is a book of striking design and beauty with its matte black cover, yellow ‘owl eye’ coloured spine, stunning artwork and photographs, relaxed typography, smooth paper with quality printing, and its unusual landscape format, which I like. Håkan Delin’s elegant depiction of an Omani Owl illustrates its front cover – we’re treated to 57 more of his beautiful artworks throughout this book. It’s astonishing that Delin draws and paints from his long-term memory. Four CDs accompany Undiscovered Owls, with a total of 327 owl sound recordings from 34 countries and territories. The four Delin illustrated CDs fit snugly inside this book – I love the black night sky background and full moons on the inside book covers. Following this book’s introduction, nine chapters focus in detail on 27 owl species from nine genera; a third are proposed new species based on vocalisation differences. For example, within the Tyto genus, three new Barn Owl species are proposed – Slender-billed Barn Owl Tyto gracilirostris (endemic to Eastern Canary Islands), Madeira Barn Owl Tyto schmitzi and Cape Verde Barn Owl Tyto detorta. The team's exciting approach to taxonomy is integrative; they consider vocalisation differences alongside morphological, ecological, geographical and genetic evidence. An impressive 294 journal articles are referenced. Each species account is an intricate mosaic of Robb’s relaxed yet informative text, exquisite photographs, Delin’s artwork, breeding distribution map and sonograms. You're guided through different sounds made by the adults and juveniles in that species’ year. Robb takes you into the field with the team and shares their adventures and owl encounters. It’s an incredibly engaging piece of work − over 250 beautiful sonograms are presented throughout Undiscovered Owls, each interlinked with an easy to find CD track number. Don’t worry if sonograms are new to you – they’re annotated to help you to visualise, differentiate, understand and learn the sounds that you are hearing. This is an important aim of The Sound Approach’s innovative books and why they differ from other bird sound books. This team are renowned for their high quality recordings and these don’t disappoint; they're superb and I like how occasional non-owl background sounds are mentioned, such as a delightful Natterjack Toad. You can hear some sample owl calls here. I couldn’t resist leaping ahead to the Athene chapter, which begins with Robb eagerly sharing that he can distinguish two different Little Owl species by ear. Yes, that’s two Little Owl species! The first is the Little Owl found in Western Europe and the UK − Robb cites recent genetic work and proposes that Athene noctua vidalli should be reclassified as a distinct species, Athene vidalli, whilst keeping its common name. This is a split from Athene noctua 'Little Owl' taxa, which are found in Southern and Eastern Europe, North Africa and the Middle East; the latter is onomatopoeically renamed as ‘Cucumiau’, which is the sound of its distinctive aggressive ‘cucuMIAU, cucuMIAU, cucuMIAU...’ call. The Little Owl’s aggressive call is a shrill ‘MIAU, MIAU, MIAU...’. There are other call differences, but I don't want to spoil this exciting chapter for you. I really recommend this book to learn the vast array of adult and juvenile Little Owl calls. The other species (recognised and proposed) include the Common Barn Owl, Tengmalm's Owl, Northern Hawk Owl, Eurasian Pygmy Owl (photos of this owl are adorable), Eurasian Scops Owl, Cyprus Scops Owl, Pallid Scops Owl, Arabian Scops Owl, Long-eared Owl, Short-eared Owl, Marsh Owl, Arabian Eagle Owl, Pharaoh Eagle Owl, Eurasian Eagle Owl, Snowy Owl, Turkish Fish Owl, Lapland Owl, Ural Owl, Tawny Owl, Maghreb Wood Owl and Hume's Owl. Sadly, there isn't room here to review each species in detail, but I assure you that each account is riveting. Undiscovered Owls ends with The Sound Approach's incredible rediscovery of the Omani Owl Strix butleri after 135 years − the mystery surrounding this owl's taxonomy has been resolved since this book's publication. Robb says that ‘owls often force us out of our comfort zone’. I would say that Undiscovered Owls does this too, and in the same brilliant way that owls do. The Sound Approach were recently awarded the BTO’s Marsh Award for innovative ornithology − congratulations and very much deserved.